Don't Know What To Make For Dinner? 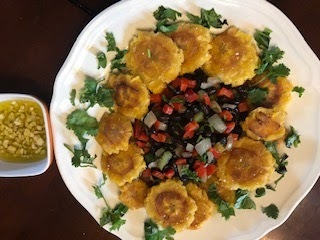 Try These Vegan Recipes! Did you ever just not know what to make for dinner? 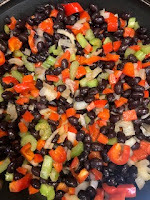 Sometimes one ingredient can spark an idea for a whole dish and this week that ingredient was a can of black beans. As some of you may know, I love simple, easy recipes and typically will use whatever I have home. 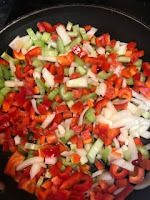 Saute the diced celery, peppers and onions in a bit of olive oil . Once veggies are fork tender, add the garlic powder, salt, pepper and black beans. Continue to cook until desired tenderness. Remove from heat and toss with cilantro. 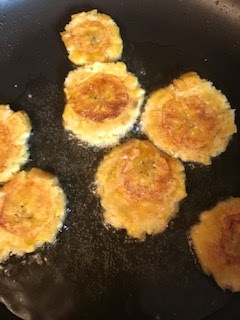 You have a great side dish, main course, filling for tacos or wraps or even a sweet plantain. 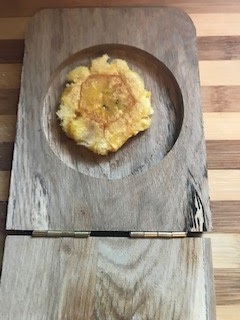 I am going to serve mine with fried tostones. 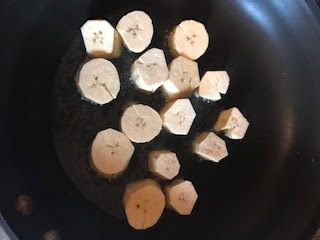 To prepare fried green plantains, I slice through the skin lengthwise and peel. 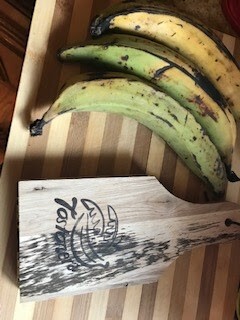 The skin is much thicker than a regular banana. 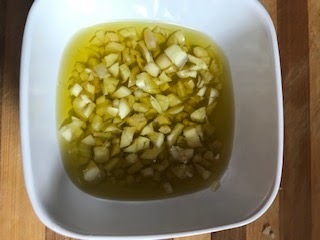 Then I slice and fry in vegetable oil for a couple of minutes on each side. I then remove from the pan and sprinkle with salt before smashing them down. 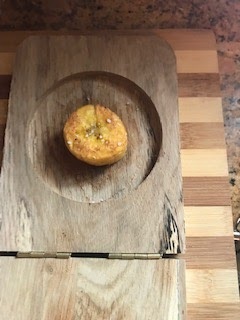 You can use a plate or a tostonera which is a wooden gadget that I just love. 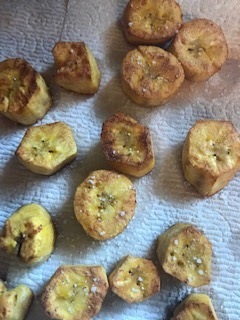 These can usually found on a display in your supermarket next to where the plantains are. 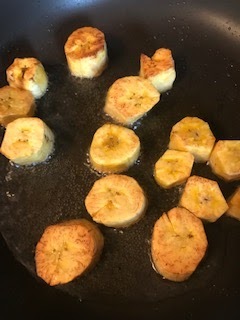 Once the plantains are flattened, I salted them again and put them back in the hot oil to finish them off. 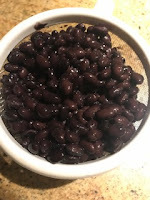 These can be served with or without minced garlic, it depends on your individual taste and make a perfect accompaniment for the black beans. Now I didn't forget about the liquid from my can of black beans. 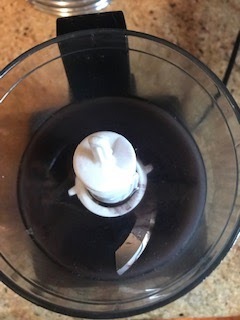 After I chilled it, I decided to use this in lieu of aqua faba. Nothing goes to waste. For those that are unfamiliar aqua faba is the liquid you get from chick peas. 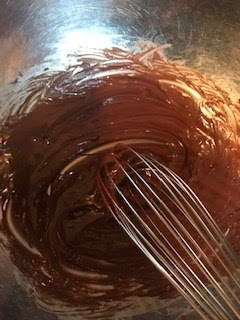 I whipped it up, melted a half cup of vegan chocolate chips, folded it together and added a half teaspoon of pure vanilla extract. 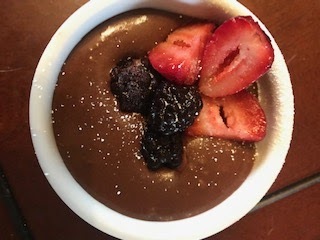 Woohoo, quick, easy Chocolate Mousse! 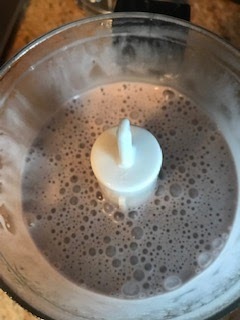 Chilled it to let it set, then added frozen fruits in had in my freezer and a sprinkle of powered sugar to finish it off. 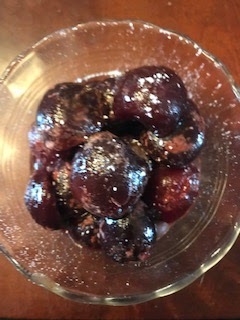 Who don't like chocolate and cherries? It doesn't have to cost a lot to look expensive!!! 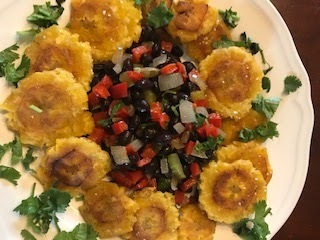 Hope you all enjoy these recipes. Whether you celebrate Valentine's Day, Galentine's Day, Palentine's Day or not at all remember if you are looking for true love you can find it at your local animal shelter. I promise the love you will find there will never disappoint you! As always be kind, it may not seem like a lot but every little of bit of kindness makes an impact and if we all do one little thing, shifts will occur and changes will happen. I truly believe this. Please keep sharing the posts on Facebook for lost and animals that need a home and adopt, don't shop. Let's put those puppy mills out of business!!!! Indulge even when you aren't on vacation!